Fashion and grooming often go hand in hand. While we openly discuss all aspects of fashion, we are not so vocal about all our grooming rituals. In fact, this is one of the most important aspects of our grooming regime, and yet, we seldom talk about it openly. Time to put all qualms and inhibitions aside and freely discuss body hair. As much as we wish and want, none of us are born hairless and we all have had our share of unwanted body hair issues. Without beating round the bush, lets get to the heart of the matter and discuss all things hair removal. As a teen, I started my hair removal journey with shaving until someone filled my head with multiple shaving myths. I then switched to waxing and since then I have been waxing. While I have occasionally opted for shaving, by and large I have stuck to waxing. 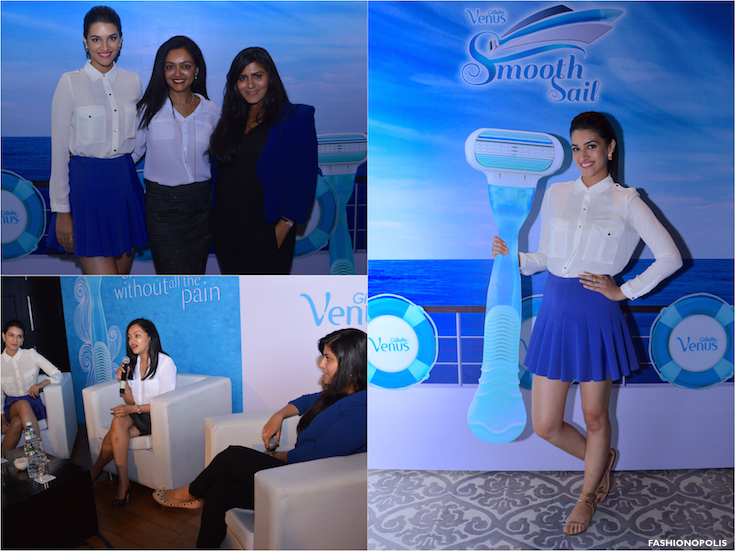 Recently, I was invited to a bloggers panel discussion with Gillette Venus brand ambassador Kriti Sanon, renowned dermatologist Dr. Rashmi Shetty and beauty expert Namrata Soni to discuss shaving and how it’s one of the most hassle free and painless methods of female hair removal. The panel discussion was the perfect opportunity for me to reacquaint myself with shaving and have all my shaving myths and doubts put to rest. From busting age-old shaving myths to sharing their personal shaving experience, the event was very insightful and informative. Speaking about Gillette Venus, Kriti Sanon said, “I have always followed a strict regime when it comes to taking care of my skin. Gillette Venus products have always been skin friendly owing to the unique design and distinctive features that perfectly suit a woman’s needs. The best part of shaving is that its hassle free and takes minimal time and enables one to be ready for any occasion at all times”. She hopes and aims to bust such age-old myths and impart knowledge about how shaving is one of the safest, most effective methods of hair removal. Sharing her shaving experience, ace celebrity makeup maven, Namrata Soni, states, “From time to time, rumors and myths have been discussed around shaving. The basic essential to achieve a healthy skin is to use the right kind of products in the right manner. While hair removal is a key part of everybody’s beauty regime, we need to also ensure that we use the method that best suits our skin type. Personally, I believe that shaving is one of the safest and most convenient methods and is suitable for all types of skins”. After having a one of on chat with the panelists and having all my queries and doubts put to rest, it is safe to say I am all set to #SubscribeToSmooth and give shaving another go with Gillette Venus. I will be busting shaving myths and sharing my shaving experience over a series of upcoming post. Watch this space for more as I get ready to Smooth Sail with Gillette Venus. I am also very skeptical about shaving....Need to change. Thats a nice dress you are wearing by the way.